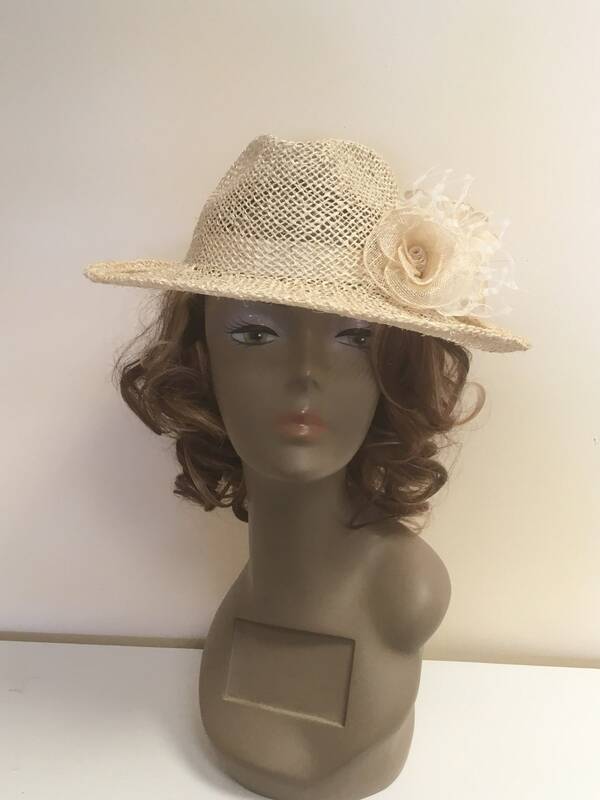 Summer straw asymmetric fedora trimmed with sinamay flower and honeycomb veiling. 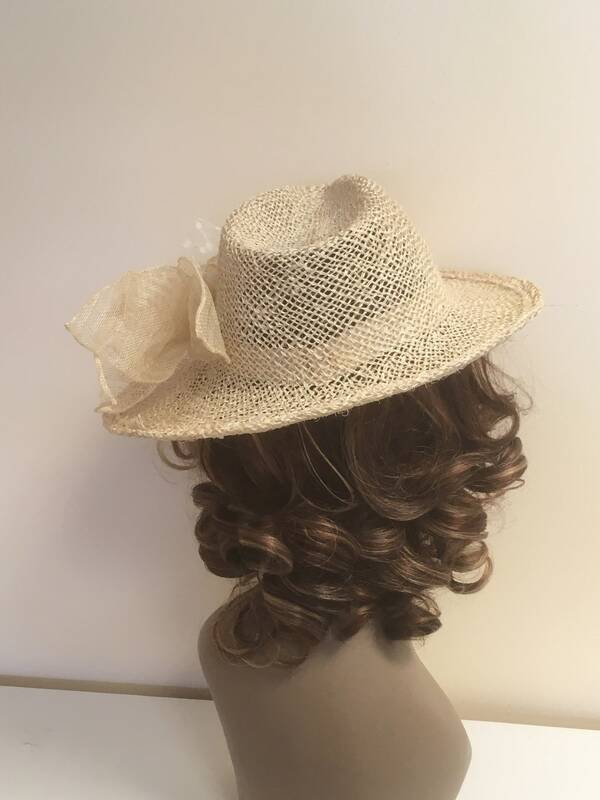 Perfect for summer parties or everyday use. All my creations are fully handmade and shipped in the hatbox where it can be stored when not in use. I always happy to assist in the request of custom made hair accessories - just ask. I send all orders with tracking number so you can track it through until it will be delivered. I offer worldwide delivery. Delivery time is depend from country you live - in EU-country is usually take up to 1 week as the longest and 2 - 3 weeks to reach any other country. To make your order complete you must provide us with information we need to fullfil it through Etsy.com authorisation, such as your name, email address, postal address, payment information, and the details of the product that you’re ordering. When you contact us directly we may need additional personal information. Why do we need your information and how we use it. 1) providing and improving our services. b) Service providers. we engage certain trusted third parties to perform functions and provide services to our shop, such as delivery companies. We will share your personal information with these third parties, but only to the extent necessary to perform these services. c) Business transfers. If we sell or merge our business, we may disclose your information as part of that transaction, only to the extent permitted by law. d) Compliance with laws. we may collect, use, retain, and share your information if we have a good faith belief that it is reasonably necessary to: (a) respond to legal process or to government requests; (b) enforce our agreements, terms and policies; (c) prevent, investigate, and address fraud and other illegal activity, security, or technical issues; or (d) protect the rights, property, and safety of our customers, or others. All custom and personalised order will usually be created & dispatched between 7 & 21 days of receipt of full payment. Please allow the full 21 days for 'made to order' designs. If your requirements are more urgent please contact me, it may be possible to accommodate a 'rush order'. There will be a non-refundable 50% charge for a 'rush order' (within 7 working days) to cover additional hours, please contact us in the first instance to see if we can accommodate your request and to set up your order. Any items that are ready to ship will be shipped within 2 working days. For accurate measuring, take a tape measure around the widest part of your head; from the forehead around the widest part of your head and back to meet the forehead. Don't pull too tight on the tape or your hat will be too tight as well as do not make it too loose. Need a larger size, just let me know. Use a clean soft brush, such as a soft shoe brush to occasionally remove dust and refresh the fibres on the hat, however only apply light pressure. For felts with a pattern use a lint roller to remove dust. It is important not to get your straw hat wet, as it will lose its shape. Please also store in a dry place but out of direct heat, as this will make the straw brittle over time. 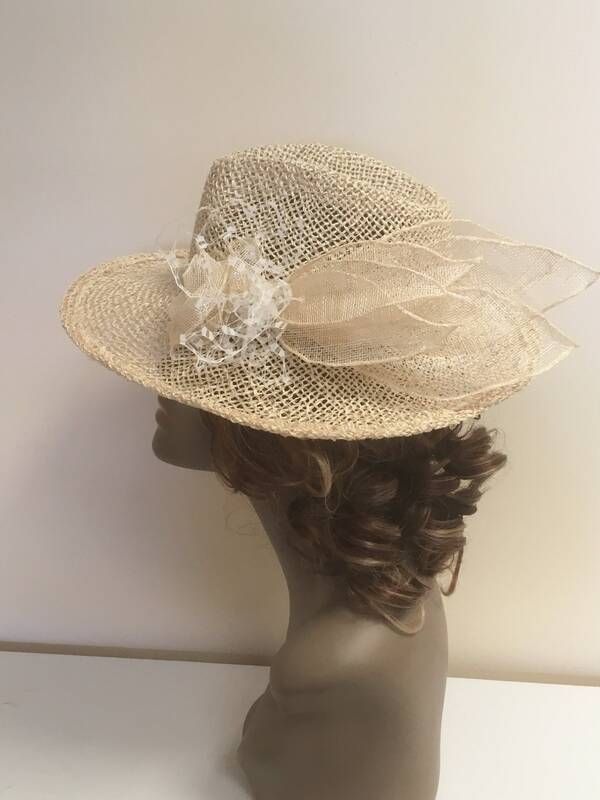 It is best way to keep all your millinery creations in special hat boxes which we provide with all orders. All designs are packed in either a luxury sturdy gift bag, hat box or gift box, depending on style and size. Every bag / box is then posted in a postal box and sealed in a posting bag. Your invoice will be enclosed, if you require a gift receipt, please let me know. 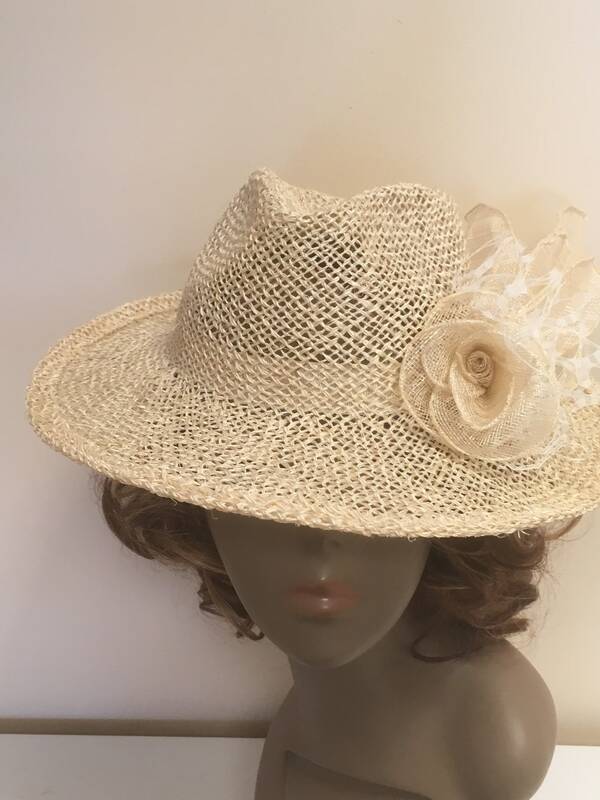 All our hats, facsinators and other accessories are available for wholesale orders. If you are stockists or shop buyers and looking to expand your shop range please contact us via messaging system. The majority of our designs are handmade to order; made to measure, made to customer specifications. Returns are only accepted on ready to wear pieces. We regret that we are unable to offer refunds or exchanges on products that are bespoke, made to order or customised. We are always happy to advise customers regarding style suitability, colour matching and measuring prior to placing an order. If for any reason the product does not meet your expectations, you can return for alteration, you need to contact us within 3 days, provide a return within 7 days of receipt and items are returned within 14 days. We reserve the right to make changes to this shop, policies and terms and conditions at any time. We may make alterations to the price, content, or nature of this shop without notice. All images and communicated feedback regarding purchased goods may be used at the discretion of Irina Bluebird Millinery across all marketing or selling venues. We retain all copyright on custom design orders and may choose to resell custom designs. Images and all content ©Irina Bluebird® All Rights Reserved.